We continue our travel north along Main Street. 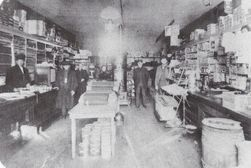 In 1882 Henry Dewald, C. Guenthner, Fred Haar, and Gottlieb Schmittgal opened the first hardware store in town on the corner of Third and Main. Guenthner and Haar took over the store later. In 1897 a machine shed was added to the side of the store. In 1901 brothers John and Joseph Wipf bought the hardware business. In 1913 the Wipf Brothers took over the rest of the property and in 1939 the building front was remodeled. John died in 1941 and his son Robert became the owner. Bob Wipf's hardware store "Our Own Hardware" was open until 1961 when Robert retired. The store was sold to W.F. Fensel and he converted the store into the Town House Cafe which was destroyed by fire in 1971. Now this is the AMPI lot. In 1882 Fred Haar and Christopher Guenthner started an agricultural implement and harness shop at this location called Guenthner and Haar. In 1901 Fred took sole ownership and ran the business along with an auto livery until 1913. Fred Haar sold Weber J.D. 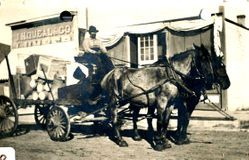 Calmar & Cooper Wagons here. In 1913 the business moved to the south end of Main street (Wien's Auto site). In 1918 Ed Dickman started a garage and repair shop here. (In 1919 Jake Neufeld, Henry Neufeld, and John Unruh started a garage business on Main street known as the City Garage). 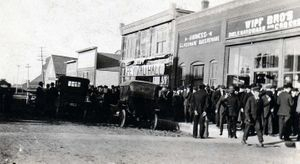 In 1922 the business was moved here and Jake Neufeld became sole owner. He operated J.C. Neufeld Auto Co. until 1952. AMPI truck service building today. 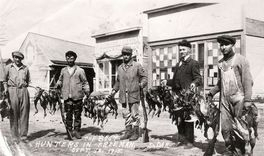 Chas Wilde opened a blacksmith south of the Hofer Tschetter store in 1917. In 1929 Chas was killed in an explosion at the shop. First livery barn in town was south of Thompson Yards run by Henry Pfeiffer, run by Blum and Delzer. In 1898 Andrew Hofer and John Tschetter bought the building and ran a General Merchandise business from 1898 to 1914. Julius Miller's butcher shop "Miller Meat Market" moved in later. In the early 1880's Guenthner and Haar opened a meat market here. They later sold the building and the business moved south (Laber Meat Market). In 1884 Henry Keith and Henry Nusz built a lumber yard and later sold it to St. Croix Lumber Co. In 1898 J.H. Queal started a lumber here yard which ran for a number of years until Thompson Yards began in 1929. The building is now owned by Freeman Lumber Company.